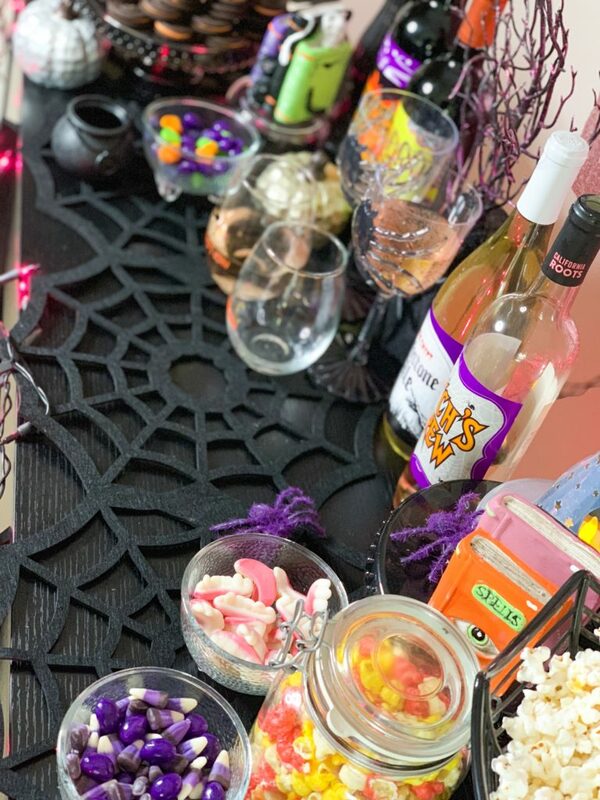 It’s that magical (literally) time of the year to get festive, eat candy, drink wine and gather with your best witches. When given the option, 8 times out of 10, I will chose staying in over going out. A girls night in means spending less money, spending more quality time with your friends, and having more control over the experience and outcome. 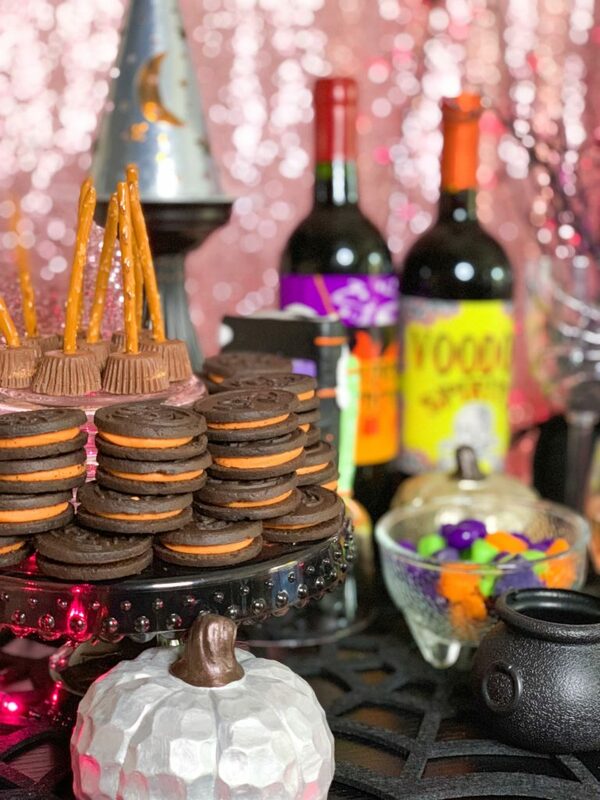 Halloween is on a week night this year, so hosting a low key gathering is a great idea for those of us who have to wake up early for work the next day. 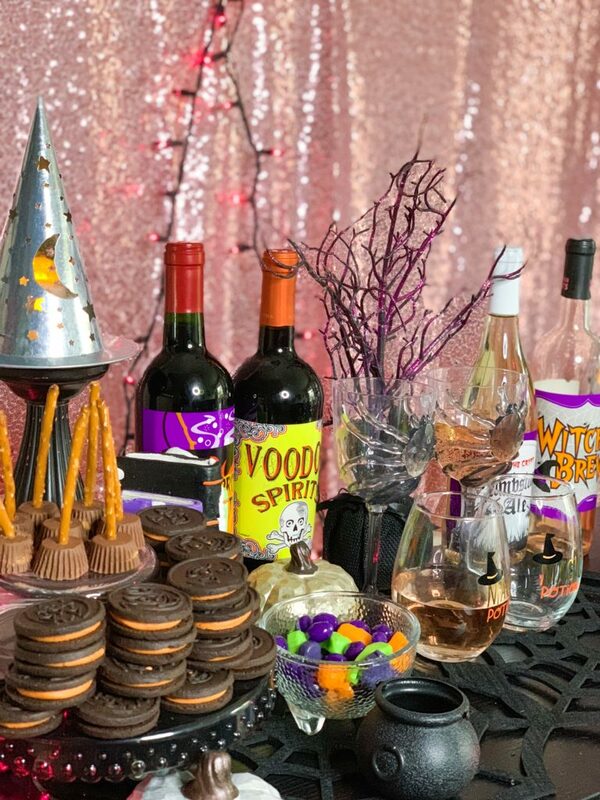 I seriously can’t think of a better way to celebrate this spooky season than with a fun witch themed girls night! 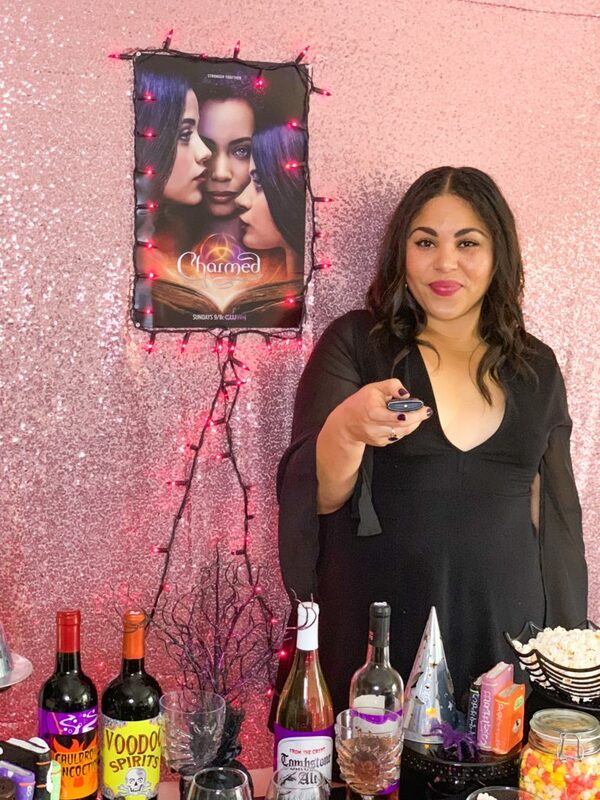 I love all things supernatural, witchy and TV shows, and I’m so excited to be partnering with Charmed and Her Campus Media to bring you today’s blog post. 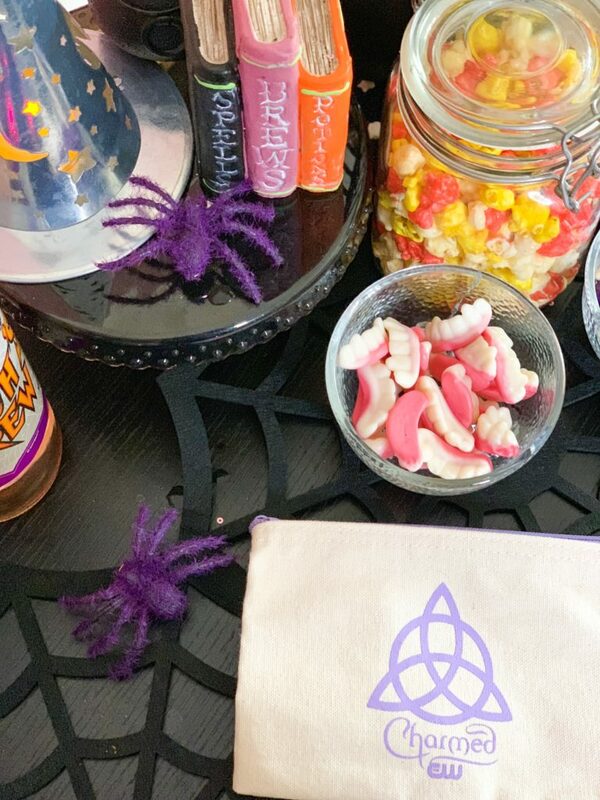 Keep reading to learn how to host your very own witchy girls night in. 1. Get witch themed decorations. Your decorations will help to set the tone, and allow you to show off your creativity. I’ve shared my tips for decorating on a budget before (see here), but I strongly believe in picking a color scheme and going from there. 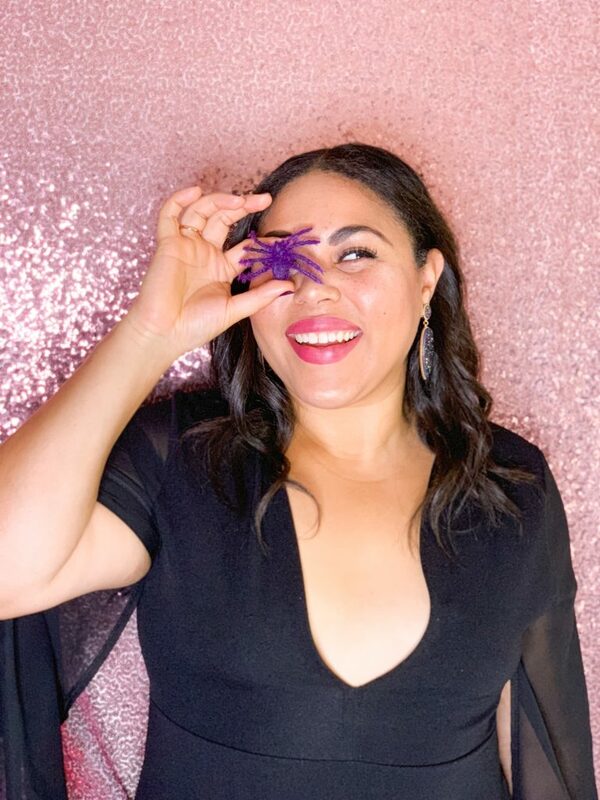 For this witchy celebration I wanted to keep it bright and girly, so I opted for lots of purple, pink, black and orange tones. I incorporated spiders, cobwebs, cauldrons, twinkle lights, pumpkins and witch hats for some spooky-yet-feminine whimsical vibes. 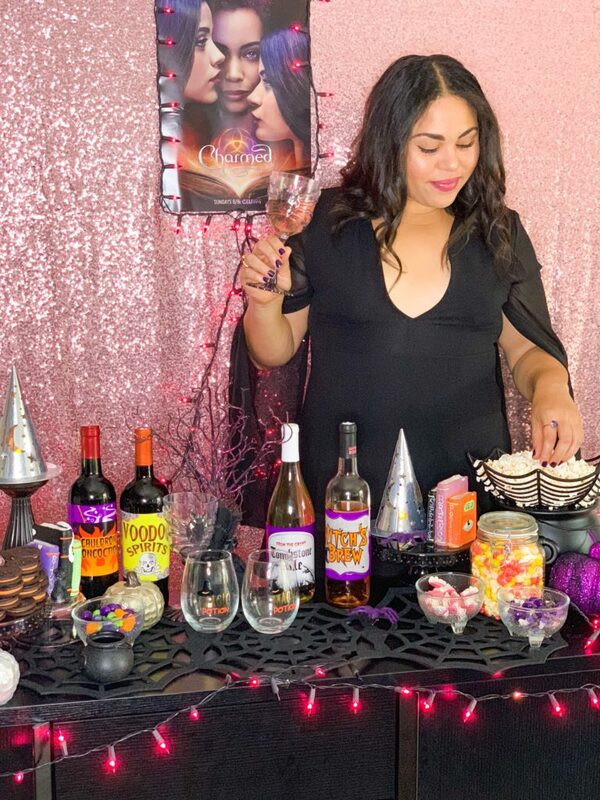 I absolutely loved the witchy wine labels and spell books! 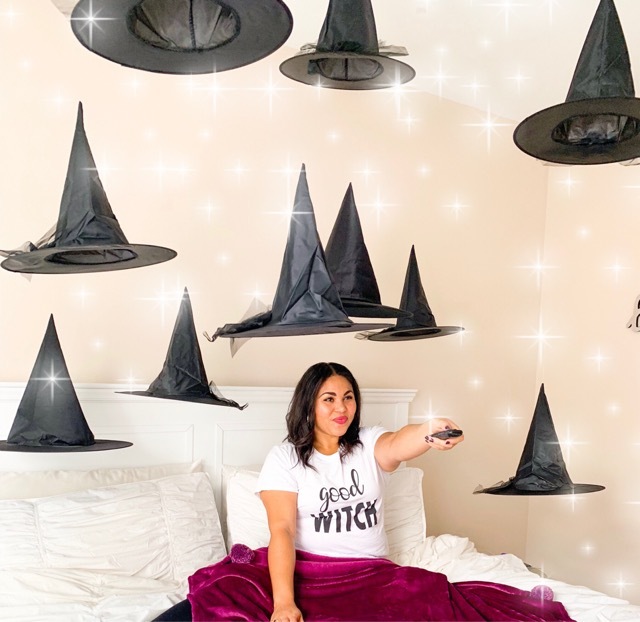 I also had some floating witches hats in my bedroom that were so cool, and would be perfect for this occasion (see at the bottom of this post for photos + a DIY tutorial). I got almost all of these decorations from Target and The 99 Cents Store, so check there for your decor needs. 2. Watch a witchy show together. What’s a girls night in without a TV show or movie for you and your girls to bond over?! For this witchy night, we’re going with Charmed. 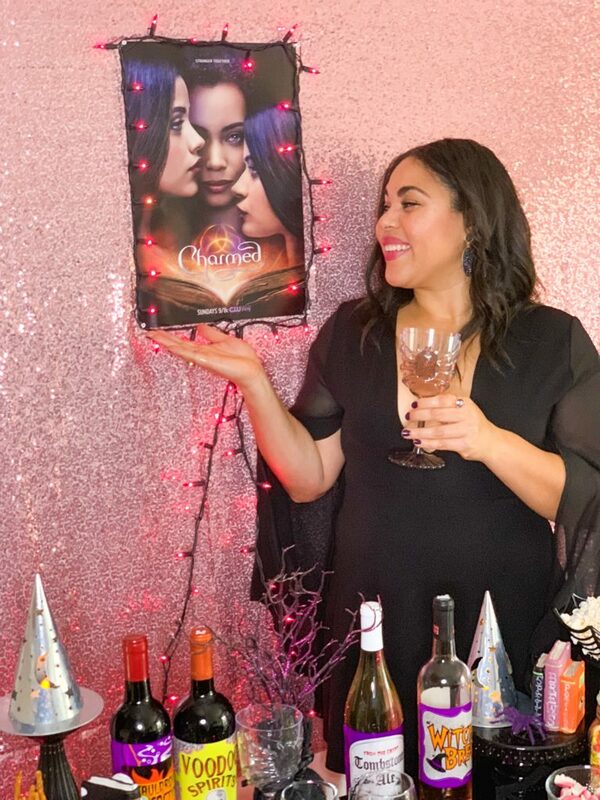 If you’re like me and grew up watching the original Charmed series, you’re going to love the reboot (which is co-produced by some of the same producers of CW’s Jane the Virgin)! 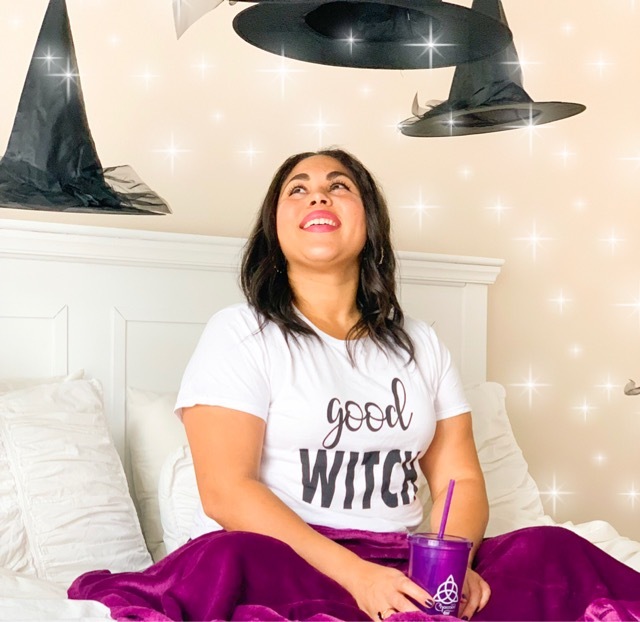 The funny, feminist and feisty reboot is about sisters who discover they have magical powers, and follows their journey navigating life as new witches in a college town. It’s all about sisterhood, and the tagline is “stronger together,” so it really is the perfect show to watch with your crew. 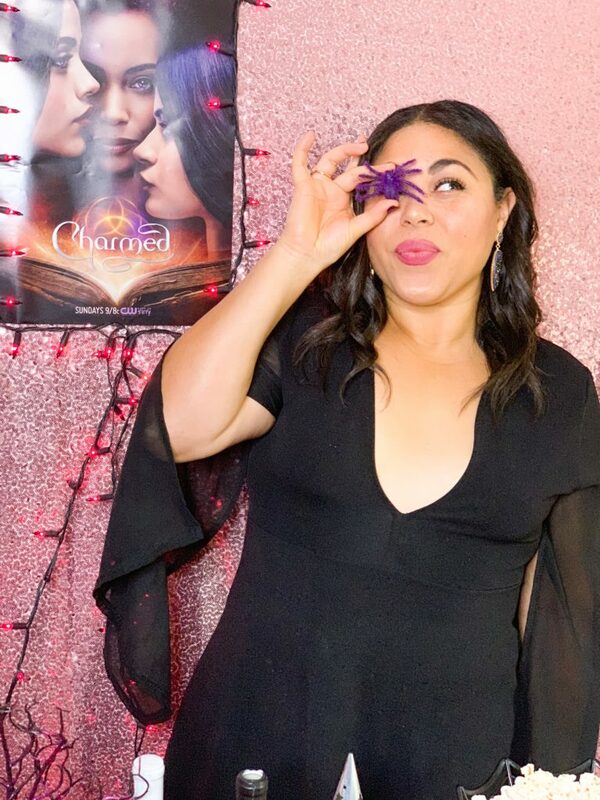 The Charmed series premiere is on Sunday, October 14th at 9/8c on The CW. I hope you’ll tune in with me and your best witches! 3. 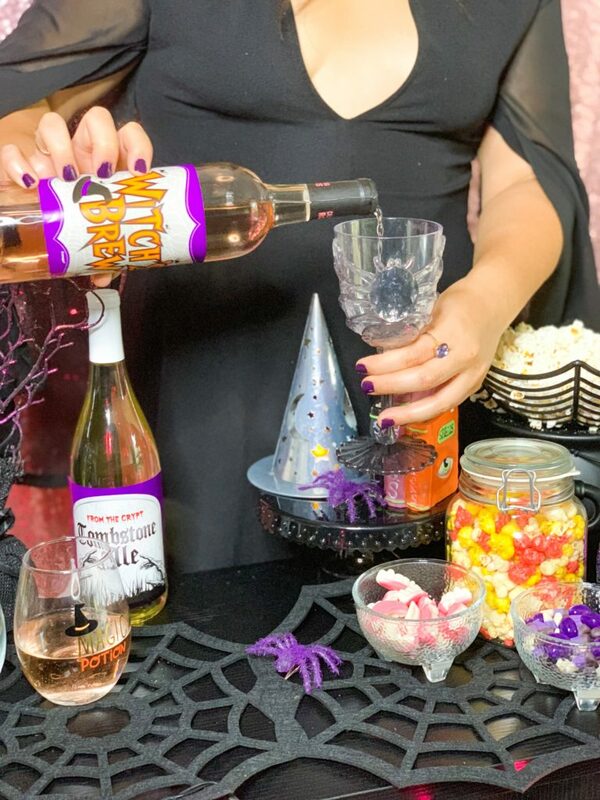 Pick the perfect witch’s brew (aka wine)! If you don’t have wine on hand, is it really a girl’s night in? Nope. Buying lots of wine can get pricey, so I recommend having this be a BYO (bring your own) type situation where all of the guests bring a bottle of wine of their choice! Regardless, you still want to have a few bottles on hand. If you’re on a budget try California Roots $5 Target wines (read my reviews of all of them here), or check out Trader Joes for some awesome wine deals (see my picks here). 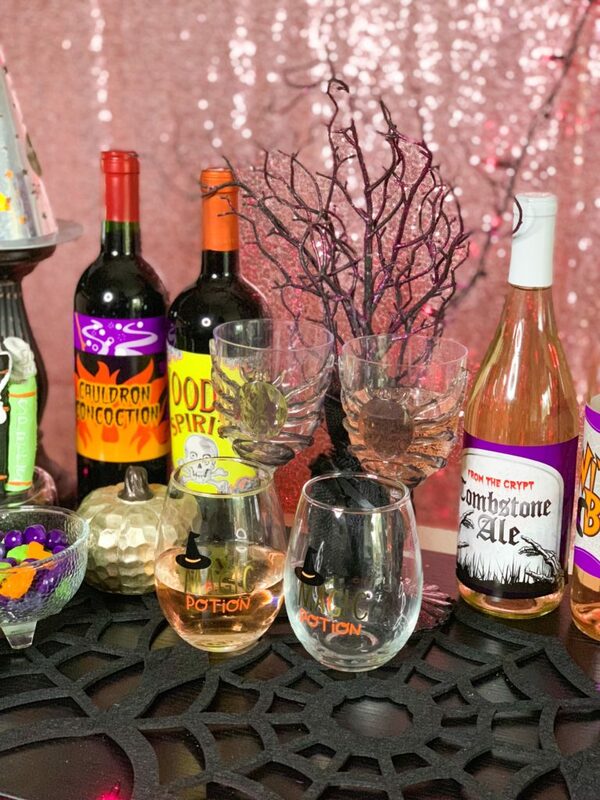 Once you’ve selected the wines, slap on a witchy wine label and get to sippin! 4. 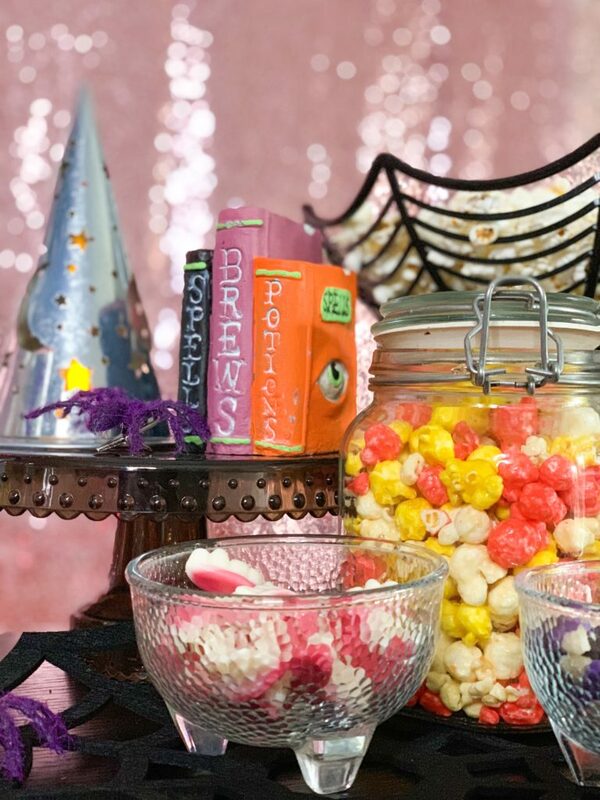 Stock up on spooky snacks. The snacks are almost as important as the wine (almost). Get finger foods that are easy to eat and won’t be too messy. I really don’t eat candy or sugary snacks very often, but I will definitely make an exception for occasions like this. 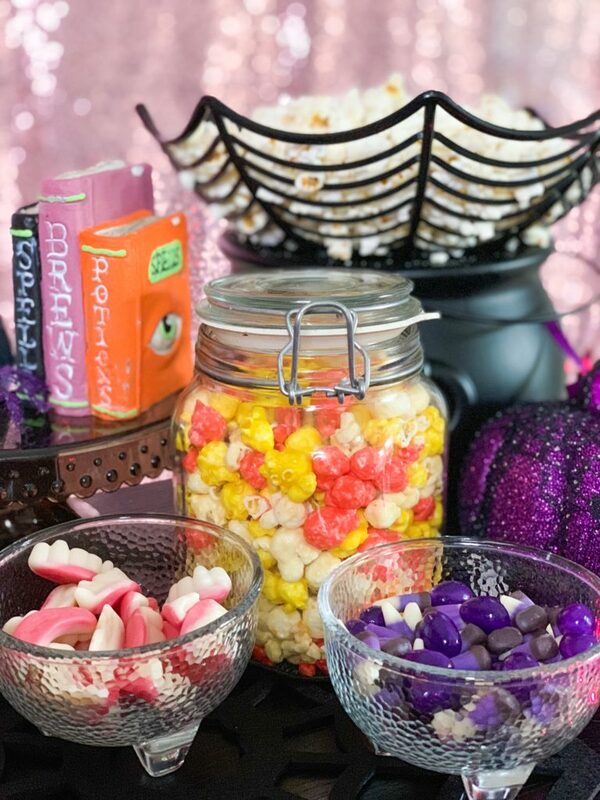 We opted for Halloween themed cookies, candy corn popcorn, classic popcorn, witches brooms (DIY- peanut butter cups + pretzel sticks) and an assortment of spooky treats. Pizza is always a great option, as well! 5. A good slumber chamber with floating witch hats. You’re never too old for a slumber party! 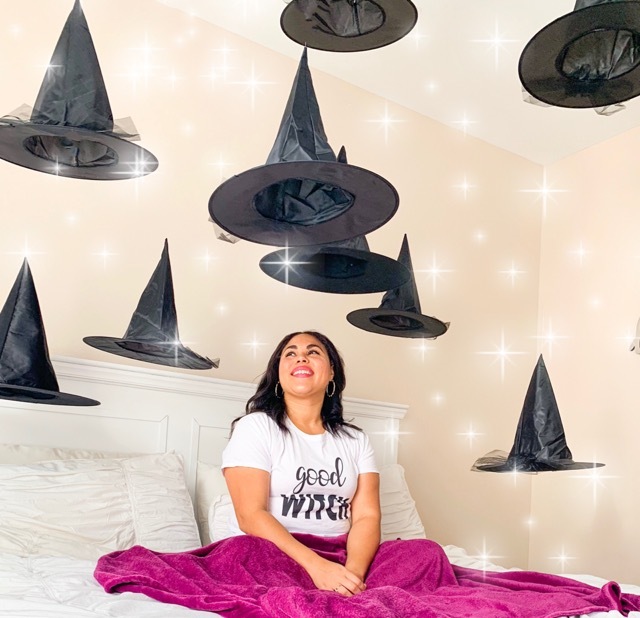 If you want to turn your girls night in into a slumber party, I love this floating witch hat idea! You can do this in your bedroom or living room, and it will add such a fun and whimsical vibe. You can totally DIY this by following these simple directions here. 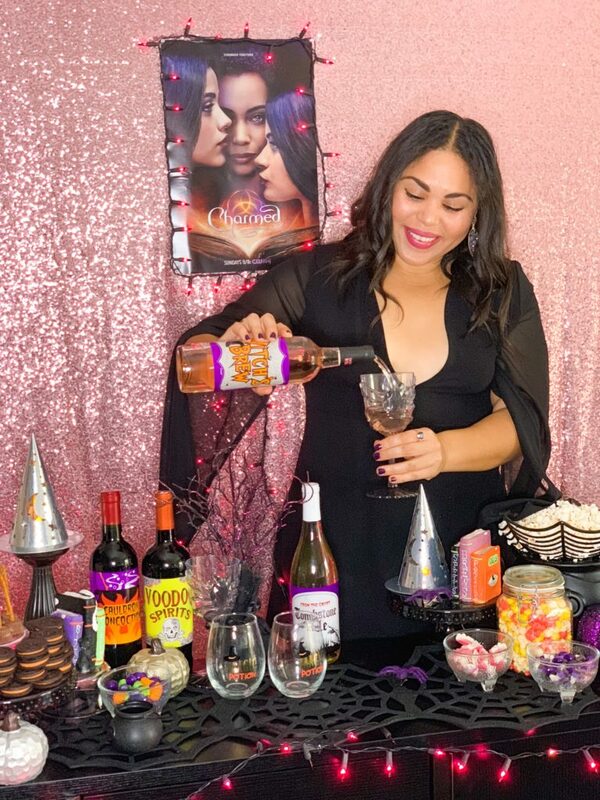 I had so much fun with this witch themed girls night in! I legit can not wait for the season premiere of Charmed (which airs on Sunday, October 14th at 9/8c on The CW), and hope you’ll watch along with me. I’ll bring the wine! If you were a witch, what would your superpower be? Mine would probably be mind reading or flying! Tell me below in the comments. ummm i am FREAKING OUT this is the cutest thing ever!!!! i wish we could do this exact night together! Thank you so much! And agreed, we need to do this!! Such a cute blog post! You have amazing ideas and are so creative. How did you enjoy the premiere yesterday? Girl, you had me at wine and candy! Now I’m craving a good girl’s night in…I’m going to have to set one up! P.S. You look AMAZING in that dress!